Inverotel - Tourism Minister, Hon. Edmund Bartlett (C) engages in discussion with (L-R) Encarna Pinero, President of Inverotel, Sabina Flux Thienemann, Vice-Chairman and CEO of Iberostar Group, Abel Matutes Prats of Grand Palladium and Donovan White, Director of Tourism, Jamaica Tourist Board. The occasion was an official meeting with Inverotel at FITUR in Spain on January 25, 2019. The largest block of Spanish hoteliers and investors, Inverotel, has indicated they are fully on board with training through the Jamaica Centre of Tourism Innovation (JCTI) as well as the Ministry’s pension scheme. The group sees training and development of their staff as critical to their overall operation and supports them being trained through the JCTI. They are also on board with the Ministry’s pension scheme. 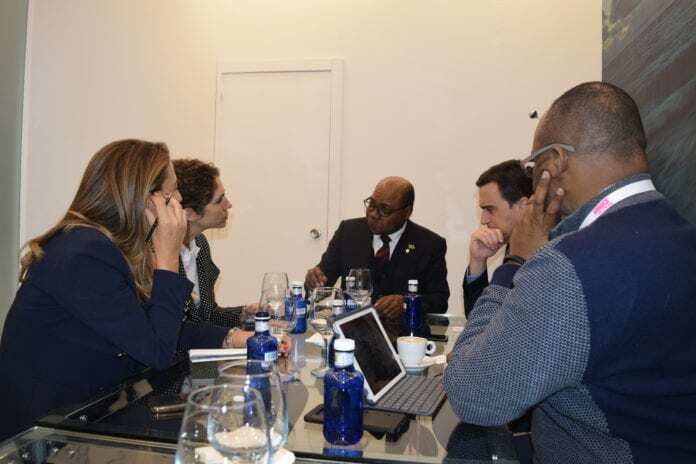 Support for both initiatives follows a meeting at FITUR in Spain with Minister of Tourism, Hon Edmund Bartlett. “I am very pleased by the support received by our Spanish partners and their willingness to help develop Jamaica’s human capital through training and our pension scheme. This shows that they understand that our people are crucial to the growth of the sector and as such need to the tools to build capacity,” said Minister Bartlett. President of Inverotel, Encarna Pinero, who lead the discussions for the group also discussed strategies to increase locally supplied goods for the sector and safety and security. Through Spanish stakeholders, Jamaica’s tourism industry has seen investments amounting to approximately US1.7billion and about 25% of the rooms constructed. Minister Bartlett is currently in Spain participating in FITUR, the largest International Tourism Trade Fair for inbound and outbound Ibero-American markets. After several business meetings with tour operators, airline representatives, other industry partners and hoteliers, it was announced that Jamaica would be benefitting from USD750Million in Foreign Direct Investment and 3000 new rooms from hotel chains H10 and Princess Resorts. A motorcycle bomb went off in front of Sky Living Place in the Muang district of Pattani shortly after midnight on Friday.